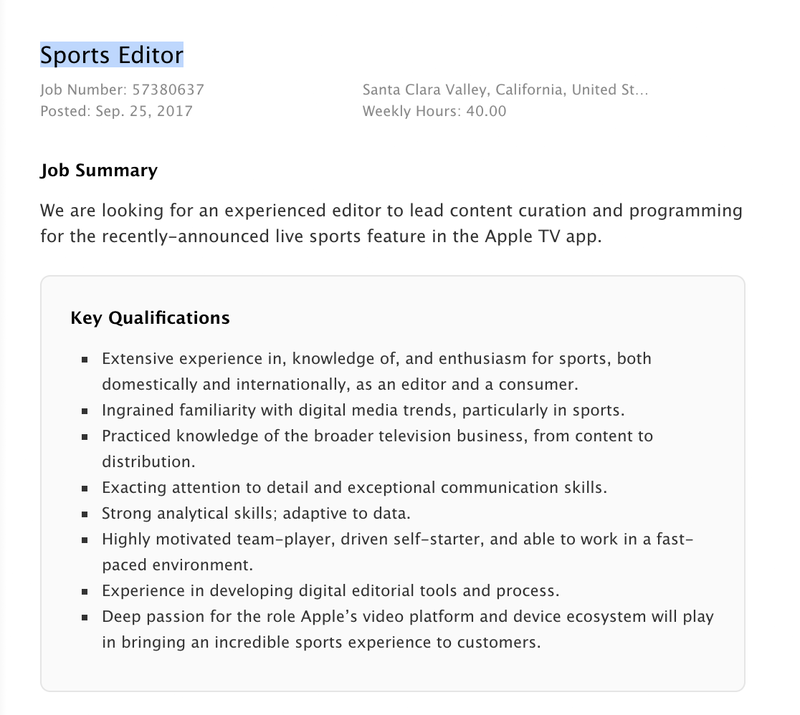 Not surprisingly, Apple is looking for someone with “extensive experience in, knowledge of, and enthusiasm for sports, both domestically and internationally, as an editor,” and it also notes experience in the broader television business as a key qualification. We are looking for an experienced editor to lead content curation and programming for the recently-announced live sports feature in the Apple TV app… Collaborate with internal Apple teams – engineering, marketing, operations, analytics, production, design – to define and continually evolve Apple’s live sports product… Conceive and maintain a thoughtful, dynamic, and always relevant editorial voice for sports programming in the Apple TV app. The new live TV features introduced with tvOS 11 brings more control and content for sports fans in both Apple’s TV app and using Siri on the device. The features go beyond just streaming sports content, including the ability for users to track their favourite teams, get on-screen notifications for events, and access everything through a new dedicated sports section within the TV app (which is likely where the sports editor’s contributions will appear for the most part). The sports programming will come from apps like NBA, MLB and the networks that stream sports events, so a subscription will still be required to access content behind a paywall as is the case with much of the content in the TV app. While the TV app is arriving for users in seven more countries — Australia and Canada, and later France, Germany, Norway, Sweden and the UK — the expanded live sports and news sections Apple previewed will come first for Apple TV users in the US later this year. Until then, check out our hands-on review with the new 4K Apple TV here.